Many golfers can struggle with the position at the top of the back swing and get into a laid off position and not really understand what's caused them to get in to that position. A laid off position at the top of the back swing would see the club rather than being parallel to the target line or pointing at it being more over to the left than this type of position. And that's absolutely characteristic of what's happened earlier on in the swing. 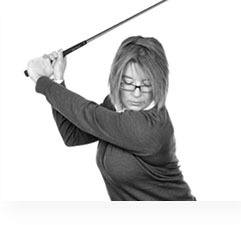 As the golfer takes the club away if the club head is more on the outside so looking in this position the club head looks more this side of my hands it will tend to make me put the club quite steeply and point it over to the left. So a good way to have a look at that swing and see what's causing that position at the top is looking up for length mirror, for right hand golf, you'd want it on the right hand side of you, and then swing the club back. If you notice that the club head is this side of your hands then the club head is too much on the outside. Ultimately that's going to make you put the club up and lay the club off at the top. The problem with this is you are now going to swing quite flat and down here on your downswing and that's going to make you approach the ball very much from the inside of the target line. It will cause you to block and hit shanks at times as well. So we need to correct that position at the top, in order to do that we want to take the club away and make sure the club head, the shaft and the left arm are all in a straight line on the take away and that's now going to allow us to turn into the correct position at the top of the swing with the club pointing directly at the target. So if you work on improving the take away its going to improve the position at the top of the swing and if you've got the club pointing at the target at the top of the swing it's going to be much easier for you to bring the club down and square the club face as you are hitting the ball. It's going to produce much straighter shots for you.